This is my first time participating in the Celebrate link up. Thank you, Ruth Ayres for this awesome Saturday tradition. This week is full of celebration! 2) I have been continuing on my #nerdlution goals and as a bonus, I keep getting to spend time with an amazing friend during work outs. Win-win! 4) My birthday present from my husband and 3 kids. It was a beautiful song they had practiced in secret for days, and then sang for me. With lyrics like: “Mommy, you’re a great cook/Mommy, you read great books./Mommy, You help when we fuss/Mommy, you take care of us! It was beautiful. The best present ever. It was Christmas decorating time this weekend. Finally. We waited until the snowiest Saturday morning we could find to drive to the Christmas Tree stand… Husband (a.k.a. Mr. Thought) trudges outside to get the van all heated up, and ready for the great tree insertion, when it becomes alarmingly apparent that we need gas (because the van putters to a stop) The snow is piling up, the kids are anxious for the tree, and we wait as the van engine is turned over, turned over, turned over. E refuses to get his boots on, H is still playing, L wants to watch a show. I want to go get the tree, or at least to know we aren’t going, so I can adjust my day’s aspirations. The van starts. Finally. Kids are loaded in and we slip and slide to the stand, where we pick the tree as quickly as we can, (“It’s freezing, this one is perfect!”) pay, and stuff the tree into the van. We realize we have blocked L’s access to her seat, so we insert her feet first as well. The tree is up. Finally. H and E decide to water it using a funnel system that somehow requires a shelf, a giant bin, some sort of metal tube, a funnel, a few pitchers of water and my glass lemonade dispenser. Nothing like a little physics with your Christmas spirit. Ornament boxes need to be dragged in, and space needs to be cleared, and kids need lunch (every day!) and somehow the day goes by with messes to clean, work to do, and play dates. So tree decorating is put off until Sunday. And then it is bedtime. Finally. So, I do something that I wish I could do more often: I ignore the mess (and there is quite the mess of train tracks and crafts and have I mentioned that Mr. Thought is remodeling our kitchen?) 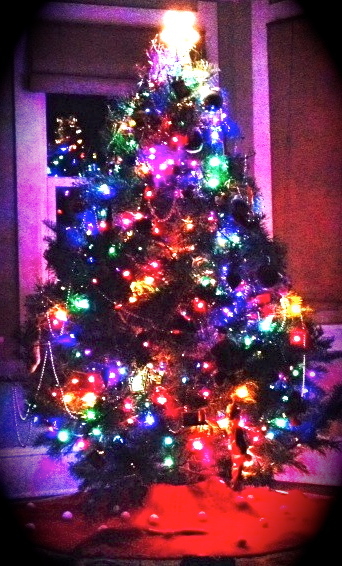 and I turn out the living room lights, and just enjoy the quiet, and focus on the Christmas tree with lights. Finally. Today I free wrote and drafted with my students: our first ever Slice of Life piece! It was a good lesson. 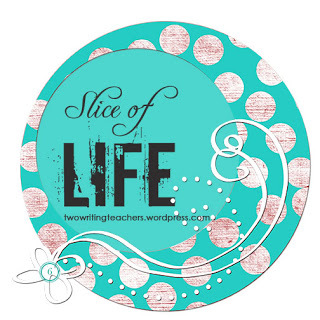 We used 2 slices that I found on my twitter feed this morning (The Honor of Watching Her Age by Katherine Sokolowski, and Because of Winn Dixie by Colby Sharp.) We closely read them to try to figure out the structure of a Slice of Life piece, and then started our own pieces. As I free wrote with the kids, I started to write about my children at home this morning. I was trying to decide which piece of my morning slice I would choose: Waking up smooshed between the 3 year old, “E” and 7 year old, “H?” The chubby sleepy cheeks of both of them, looking even younger as they sleep? Remarking with H on how his brother still looks like a baby when he’s sleeping? The soft patter of H as he sleepily makes his way downstairs, already dressed because that’s the first thing he does? My 10 year old daughter, L, waking up bright but sleepy; her brightness turning sour as clothing tags itched and hair was brushed of tangles? Husband, with his gray knit hat starting the car for me, telling me to be safe? Leaving the house with a kiss and a goodbye to all? Watching my daughter in her daily routine of coming all the way outside with me to give the final wave goodbye? Driving to school only to get a phone call that little E forgot that he already said goodbye, is sad, and wants to say goodbye again? As I sat down this evening to finish my draft of my morning slice, so I could post it on my blog like the big kid #slice13 challenger I hope to one day be, I heard E start to cough, and then get sick in his bed. What happened next is by-the-book, night-time, sick-child parenting. Put down computer, run up stairs, grab towels and wipes (it was too late). Take whimpering child (“I’m sick! I’m cold! Mama!”) into bathroom, peel off jammies, put child in the tub, rinse and repeat. . .
My new slice is this little guy, almost 4, sitting in our giant tub. The bathroom is a mess from remodeling and the laundry problem that is it’s own “slice,” I’m sure. The heater doesn’t work (Know a good heater guy who might actually call us back?) and the sinks need to be wiped down. But, the little guy! He has a soaking wet hot washcloth on his back, and is finally calm from the warm water. His eyes are closing and when I take the wash cloth off his back to rewarm it, he asks me to put back the “cozy towel.” He sleeps in the tub, totally confident and comfortable and trusting that my hands are there – letting him sleep and recover from the sick without falling in the water. He breathes comfortably. There are a few coughs here and there, but he is better than before. Out of the tub and into my bed he goes. And that is where I am writing this, with my not-still-a-baby-but-still-my-baby, cuddled up (on a towel, just in case!) Even though this slice is messy, and a little gross… I’m taking brain snapshots because I want to remember these cheeks, these snuggles, these middle of the night sleeping baths! I couldn’t stop myself from joining the #nerdlution revolution over on twitter. Fallout from high school means that I automatically feel like a ‘poser.’ A few days ago, I watched a super fun twitter chat between a few amazing people. (Colby Sharp, Katherine Sokolowski, Franki Sibberson, and Chris Lehman! ) I admire so much of what these folks do – and tweet – and this time, I felt there was a real opportunity to join the fun: #nerdlution. What I can commit to for the next 50 days ? 50 days of movement. That’s what I’ll do. I already exercise about 3 times a week – so I just need to add 4 days. I can do that. A quick mile run, or a set of intervals… The daily twitter check in. Say it with me: I can do it! 50 days of writing. I am out of practice, which is why this blog was set up and then pushed aside. I can’t post each day, but I can write each day. I just started this blog – and now my first post is a copycat of all these people I follow on twitter – ah well. There’s time for being unique later. I’m just happy to invite myself to the party. Get real info about #nerdlution on twitter, or the wonderful blogs of: Colby Sharp, Katherine Sokolowski, Franki Sibberson, Chris Lehman and Donalyn Miller. . .